As a wedding photographer in Northern Ireland one of the best parts of our job is all the different types of couples we meet and taking part in all the different plans they have for their wedding. Every couple has different tastes and different styles that they like and individual things that they want to incorporate into their own wedding in some way. We have had a bride who wore a pink dress, grooms who have decided not to do a traditional wedding speech and couples who have had their wedding reception in a parent’s garden rather than a wedding venue plus a million other different little things which personalised their wedding to how they wanted it. We love all those little differences that make up a wedding day and when we come across something new to us, it’s always worthwhile sharing as inspiration for those couples who are still in the process of making plans for their own wedding. A few months ago we photographed an American style wedding for Mary & Joe, a couple who travelled from Minnesota to get married at the Tullyglass Hotel, in Ballymena and one of the things they included in their wedding was a “first look”. Inspired by this, we also photographed another first look for Aisling and Antony, at their wedding at Belfast Castle. So, what is a first look? A “first look” is a newer but popular wedding tradition in the U.S.A and is starting to be become a trend elsewhere. Sometimes also called a pre-reveal, a “first look” is when a couple on the morning of their wedding break with the old tradition of not seeing each other until the bride is coming the aisle to share a little time together before making their way to the ceremony. Weddings can often go past like a whirlwind for the bride and groom and they often don’t get to have much time to themselves on the wedding day itself. ﻿What are the advantages to having a first look? Any stress or pre-wedding nerves will be gone before the actual ceremony. You will get to have some precious alone time that you may other wise not have been able to get. Best of all, you will be able to enjoy the ceremony more, as it will be easier for you to take it all in. 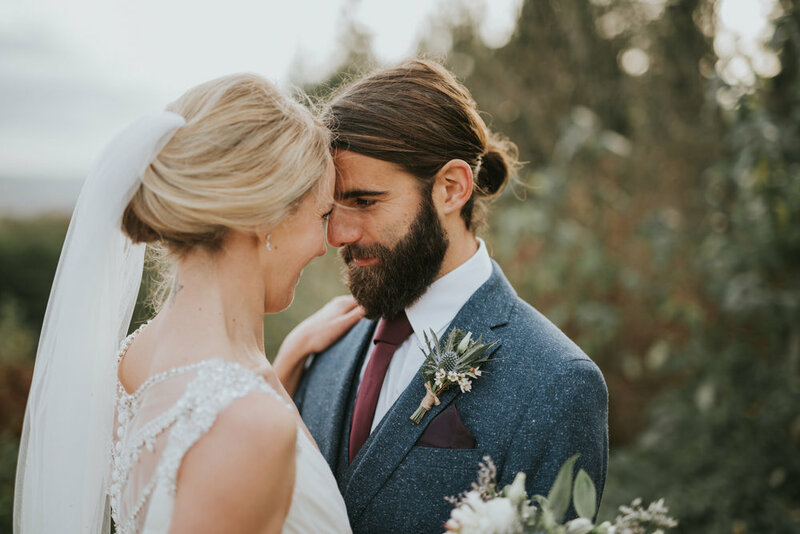 For emotional brides and grooms who might shed a few tears on seeing each other for the first time, you will be able to freshen up before the ceremony. You will able to share the moment of seeing each other for the first time on your wedding day without the usual sea of people taking photos on their phones and tablets. This will be one of the emotional parts of your wedding day which means you will also get awesome photos from your wedding photographer. 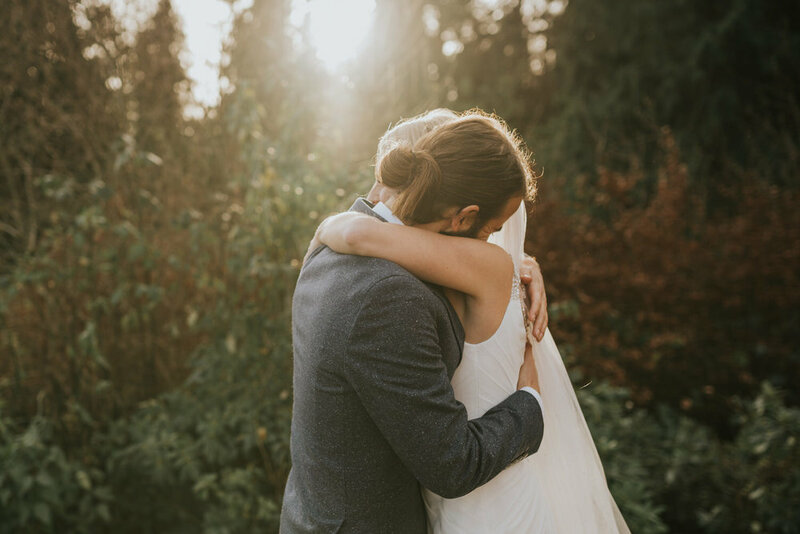 Real, emotional moments like this create the perfect opportunity for great photos and you will feel more comfortable than you will later on in the day when it is likely you will both feel a little tired and emotional after the ceremony. Wedding timelines are difficult to stick to and couples often under estimate the amount of time needed for the different parts of the day and it is often the time allocated for your wedding photographs that gets cut back if something does not run according to plan. 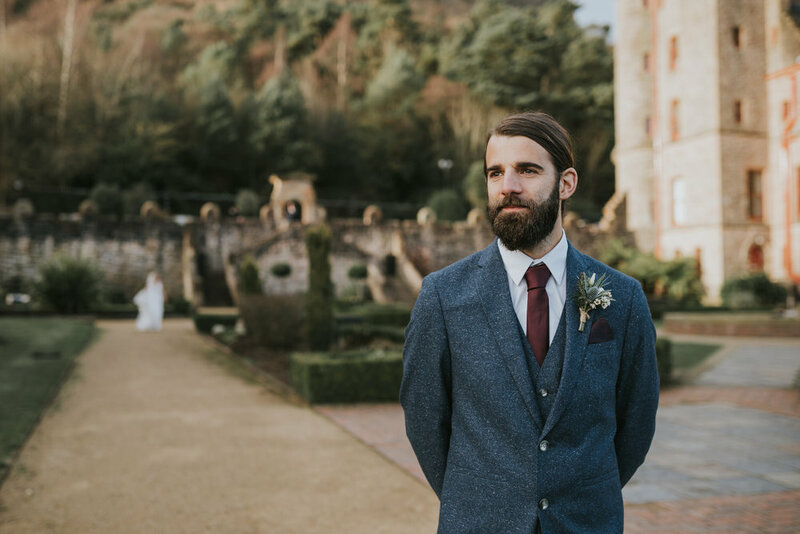 Having some portraits from your “first look” will mean that if another part of the day over runs and the time with your wedding photographer gets cut short because of this that you it won’t be just as big an issue as it would normally be. There is also another good practical reason as well, the weather! 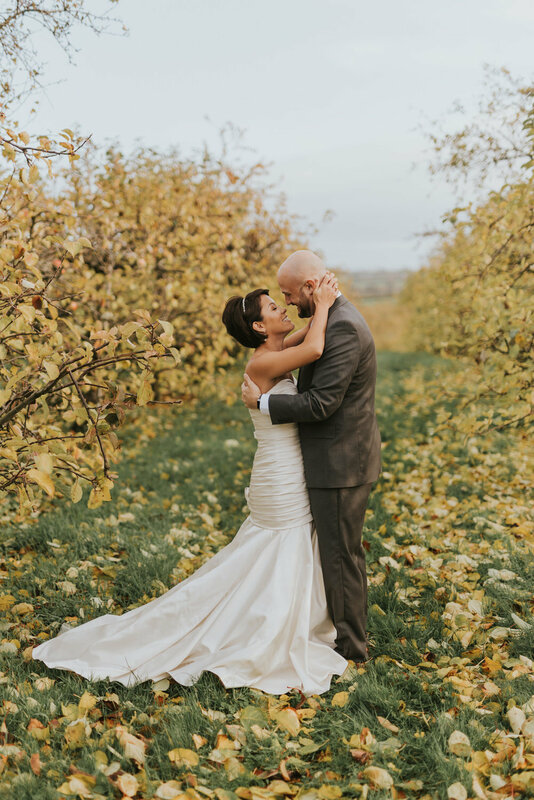 We aren’t blessed here with beautiful sunshine all year round and the weather from the point of view of your wedding photographs can sometimes be an issue. Again, having photos from the earlier part of the day will be of benefit if time with your photographer later on in the day is cut short due to bad weather and provide you with some with some outdoor photographs if you have to move indoors later on in the day. You get to choose the location. This means that you can choose somewhere close to home or where you are getting ready, that is special to you. For bride and groom portraits after the ceremony, most couples will have to choose a location that is near to where they are having their wedding reception so that everything stays on track with their wedding timeline. A lot of our couples have mentioned to us that in an ideal world they would have also liked to have had some photographs taken at locations close to home but couldn’t make it work due to the distances involved. Having a “first look” will allow that opportunity. Winter weddings are now more popular than ever before but need a little more careful planning. To get the most from your wedding photographer on the day, an early ceremony time is really important. By the time it hit’s 4p.m during the winter months there is very little usable light left to use. While this can be overcome using artificial light, this will give a different look to your wedding photographs. Having a “first look” on the morning of your wedding guarantee’s that at least some of your wedding photographs can be taken using natural light. The weather at this time of the year is also even more unpredictable than it is usually, so as mentioned above this allows for two opportunities for photographs to be taken in natural light, outdoors. Some couples might prefer to stick with established wedding traditions and will be happier seeing each other for the first time on the day of their wedding when the bride is coming down the aisle. It is your wedding day so should absolutely have it as you want it. You may not want to have to get ready earlier in the day. Having a first look will mean that you will need to be ready a little earlier than would be normal. 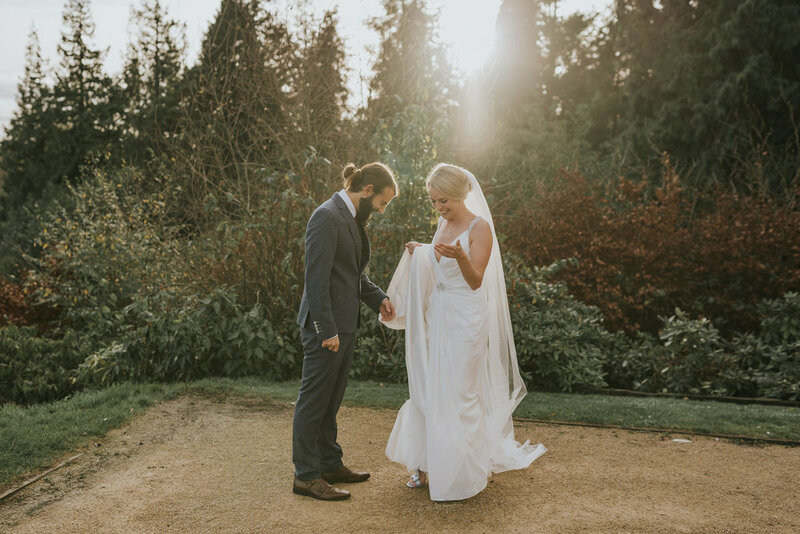 We know that for a lot of brides that their wedding dress is really important to them and they won’t want to take any chances of their dress being anything else other than absolutely perfect before the ceremony. If you are walking around outdoors for your “first look” there is always the chance that the bottom of your dress could get dirty. In terms of time needed for a “first look” you would need to decide for yourselves but we would expect that around 30 minutes would be needed for your photographer to get photographs and for you to share the moment. Your wedding timeline may not allow for that. A “first look” won’t be for everyone and like everything else to do with your wedding should be something that you should decide between yourselves as a couple based on what you want from your wedding day and without anyone else’s influence, least of all ours. If, however you are a couple that thinks that a “first look” could add to your wedding day we would be delighted to photograph it for you and are we are happy to talk through your wedding timeline with you, to try and find a way of making that work for you.